This was probably inevitable. 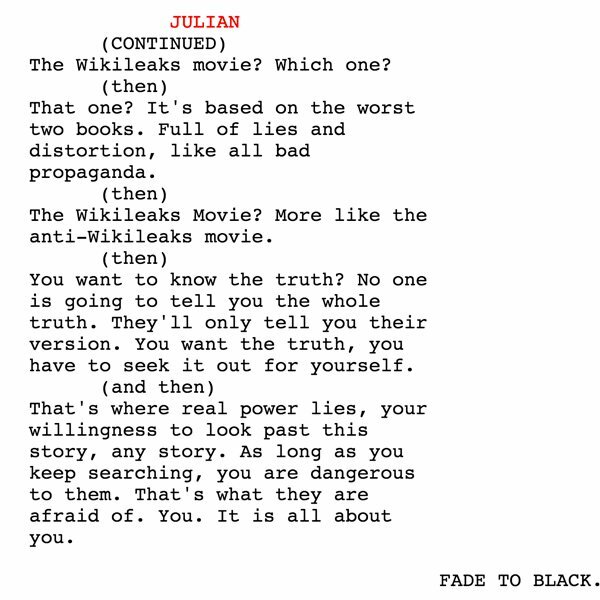 Wikileaks, the organization devoted to disseminating information and spreading it far and wide, has object to the existence of the movie The Fifth Estate since it went into production, and now they've retaliated in the only way they possibly could have: by leaking the film's script. Not only that, but they include a 4,000 "internal memo" picking apart details from the film, from accusing it of being one-sided to pointing out basic inaccuracies and fictionalizations. You can read both the script and the memo here, where Wikileaks assures readers, based on reports from those who were at the Toronto Film Festival premiere earlier this month, that the version of the script here is very similar to the final version of the film. Sean caught the Toronto premiere as well, and was nearly as unimpressed as Wikileaks themselves, without writing it off entirely: "Convoluted and a bit too slick for its subject matter, The Fifth Estate raises too many interesting questions about online journalism and the accomplishments of Assange to fully dismiss it. " Though leaking the script for The Fifth Estate was inevitable on the part of Wikileaks, it feels like a bit less of an effective move given that the film has already premiered, for both critics and paying audiences at the Toronto Film Festival. The film arrives in theaters on October 18, and the way to examine it that's probably the most true to the Wikileaks spirit is to see it for yourself, then read their evidence to the contrary. You can check out the film's trailer below-- you know, just for the maximum amount of information. It's kind of what Julian Assange would want.